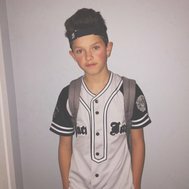 Is jacob sartorius your future boyfriend???? 1: Where is his home town ? 2: How old is he ? 3: When is his birthday ? 4: In what year was he born in ? 5: Which social media is he most famous for ? 6: When did he post his first vine ? 7: In which year was his first vine posted ? 8: Does Jacob have a brother or a sister ? 9: What is jacobs brother/sister called ? 10: What is jacobs favourite colour ? 11: where would you go on a first date ?